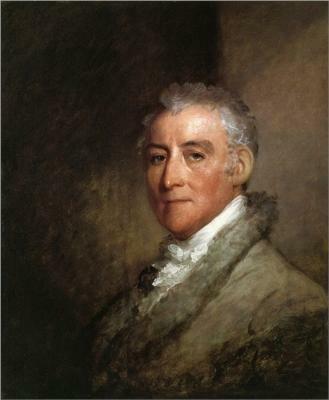 John Trumbull (June 6, 1756 – November 10, 1843) was an American artist during the period of the American Revolutionary War and was notable for his historical paintings. He has been called "The Painter of the Revolution". His Declaration of Independence (1817) was used on the reverse of the commemorative bicentennial two-dollar bill. As a soldier in the American Revolutionary War, Trumbull rendered a particular service at Boston by sketching plans of the British works. He witnessed the Battle of Bunker Hill. He was appointed second personal aide to General George Washington, and in June 1776, deputy adjutant-general to General Horatio Gates. 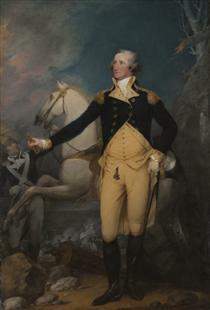 He resigned from the army in 1777 after a dispute over the dating of his officer commission. 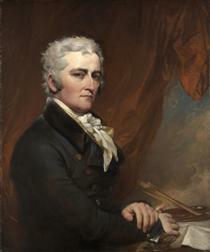 In 1784, following the British recognition of the United States' independence, Trumbull returned to London for painting study under West. While working in his studio, Trumbull painted Battle of Bunker Hill and Death of General Montgomery in the Attack on Quebec. Both works are now in the Yale University Art Gallery. 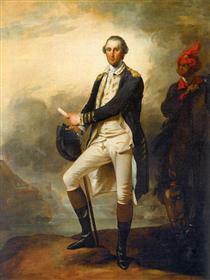 In 1785 Trumbull went to Paris, where he made portrait sketches of French officers for the Surrender of Lord Cornwallis. 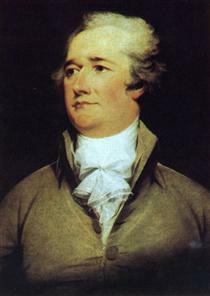 With the assistance of Thomas Jefferson, serving there as the US minister, Trumbull began Declaration of Independence. 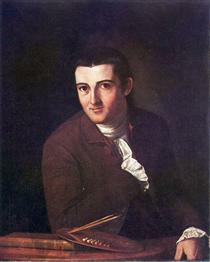 Over the next 5 years Trumbull painted small portraits of signers, which he would later use to piece together the larger painting. If the signer was deceased, a previous portrait would be copied, as was the case with Arthur Middleton, whose head position stands out in the painting. 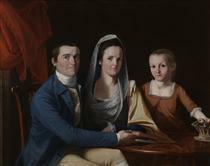 While visiting with each signer or their family, Trumbull, always looking for funding, used the occasion to sell subscriptions to engravings that would be produced from his paintings of the American Revolution.